Officer Erick Halpin of the Damariscotta Police Department helped save the life of a man who had overdosed by using two doses of the overdose-reversing drug Narcan before paramedics arrived the afternoon of June 2. Halpin was dispatched to respond to a potential overdose in Damariscotta just after 1 p.m. When he arrived, he found a man in his 30s who “appeared to be deceased,” according to interim Damariscotta police Chief Jason Warlick. The man was not breathing and did not have a pulse, Halpin said. His skin was cold to the touch and started to turn color. Halpin immediately used both doses of the Narcan nasal spray he carries and performed CPR until Central Lincoln County Ambulance Service arrived minutes later, Warlick said. “The EMTs were right there behind me and were able to administer help quickly. It wasn’t me by myself. It was a group effort that brought him back,” Halpin said. As the EMTs worked on the man, he slowly regained consciousness and began breathing again, Halpin said. By the time he was brought to LincolnHealth’s Miles Campus in Damariscotta, the man had begun to speak. Hospital personnel told Halpin his quick thinking saved the man’s life, Warlick said. All four of the Damariscotta Police Department’s full-time officers carry two 4-milligram doses of Narcan nasal spray after completing training last year, Warlick said. The medication is provided to the department through a program launched by Maine Attorney General Janet Mills. Halpin said his actions “weren’t really heroic,” and that he was just using the training all law enforcement agencies in Lincoln County have received about the use of Narcan. The training was part of the Lincoln County Recovery Collaborative, a partnership between Lincoln County law enforcement agencies, health care providers, addiction treatment providers and community organizations to combat the drug crisis through community outreach and treatment. This was the first time a Damariscotta officer has used Narcan to successfully bring a person out of an overdose, Warlick said. The department does not know what drug caused the man’s overdose, but the investigation into the medical call is ongoing, Warlick said. Narcan is used to treat overdoses on heroin, fentanyl and prescription opioids. If another drug, including cocaine, caused the overdose, Narcan would not have had any effect. The department encourages anyone in need of addiction treatment to contact the department at 563-1909 to be connected with local resources through the Lincoln County Recovery Collaborative. The collaborative focuses on providing treatment to heroin or opioid addicts before their addiction leads to incarceration or death. “We hope to utilize the Lincoln County [Recovery] Collaborative program to assist this person and others,” Warlick said. 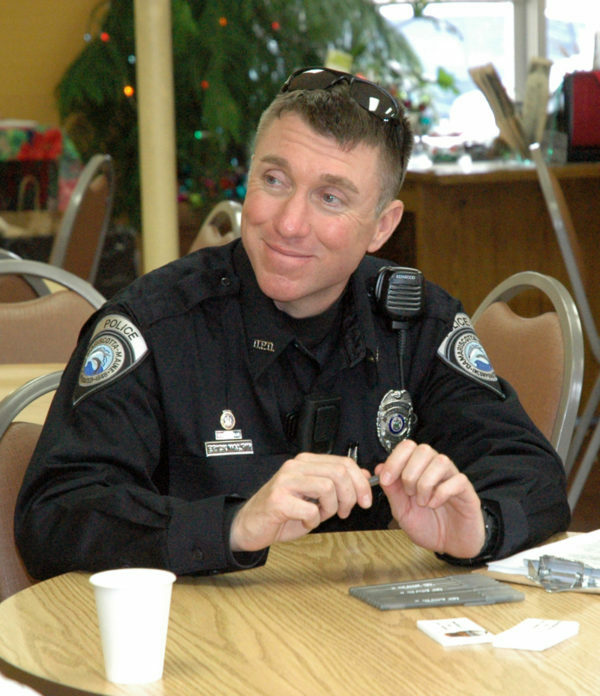 Halpin joined the Damariscotta Police Department as a reserve officer in October 2014 after returning from deployment to Afghanistan with the 488th Military Police Company of the Maine Army National Guard. He became a full-time officer later that year and graduated from the Maine Criminal Justice Academy in December 2015.